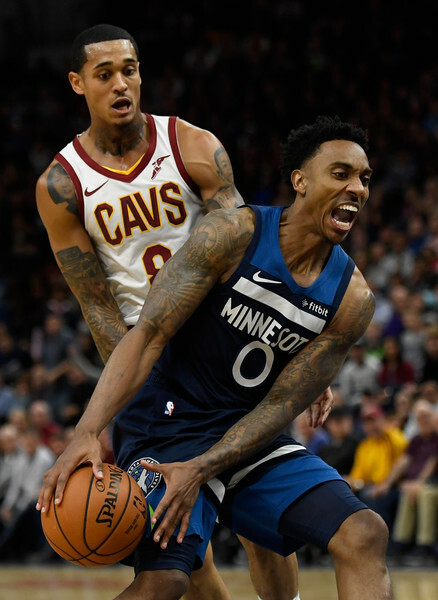 Jordan Clarkson #8 of the Cleveland Cavaliers collides with Jeff Teague #0 of the Minnesota Timberwolves during the fourth quarter of the game on October 19, 2018 at the Target Center in Minneapolis, Minnesota. The Timberwolves defeated the Cavaliers 131-123. NOTE TO USER: User expressly acknowledges and agrees that, by downloading and or using this Photograph, user is consenting to the terms and conditions of the Getty Images License Agreement.